Who was John Abeel (aka Cornplanter)? 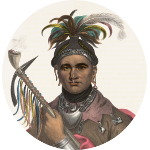 John Abeel (aka Cornplanter) was a Seneca war chief. His father Johannes “John” Abeel was a successful businessman and the second Mayor of Albany, New York. His mother was a Seneca princess known as Gah-hon-no-neh or She-who-goes-to-the-river. During the French and Indian War of the mid-1700s, Cornplanter allied with the French against the British and was present at General Braddock's defeat. However, during the American Revolution, Cornplanter allied with the British against the American cause. In 1778 Cornplanter was present at the Battle of Wyoming Valley, Pennsylvania. The Americans refer to the battle as the Wyoming Valley Massacre as many settlers were killed and their properties destroyed. Since Seneca Chief Cornplanter's father was Danish, he has a few famous kin through his father's family. The most notable of Chief Cornplanter's kin is the Roosevelt family with whom he has kinship to Presidents Theodore Roosevelt and Franklin D. Roosevelt, and First Lady Eleanor Roosevelt. He also has a family connection to inventor Thomas Edison and Declaration of Independence signer Philip Livingston.